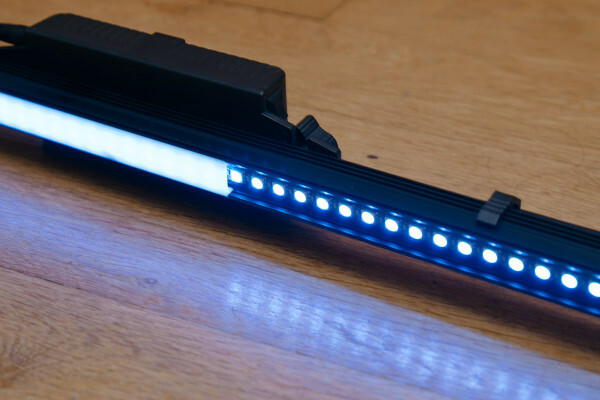 More than one year ago the Pixelstick was announced through a Kickstarter project. I have followed the project from day 2, to see if they would make it and how the final product would look. Personally, I am not much of a light-painter, but this Pixelstick really intrigued me. 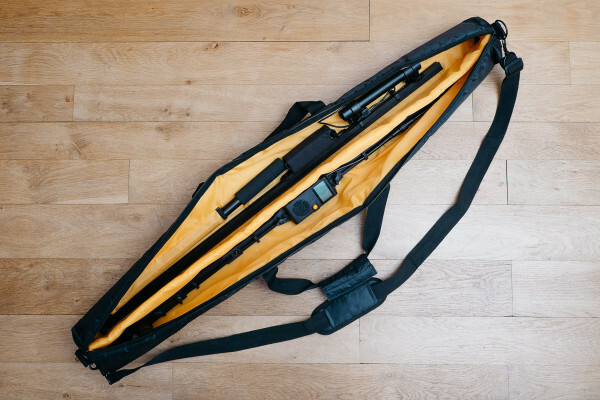 It not only seemed like a great photography tool, but also like a cool high-tech gadget. 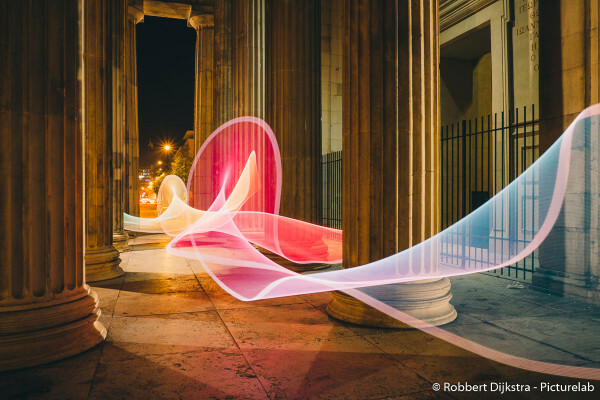 If you haven’t heard about the Pixelstick, it is a multicolour LED strip that can be used to leave a trail of light on your long-exposure photographs. By hooking the RGB LED strip to a controller that alternates the colour and brightness of the LEDs it is possible to change the effect the light has on the final image. What is special about the Pixelstick is that it is not limited to a few pre-set patterns for the LEDs, but instead reads files from an inserted SD card. 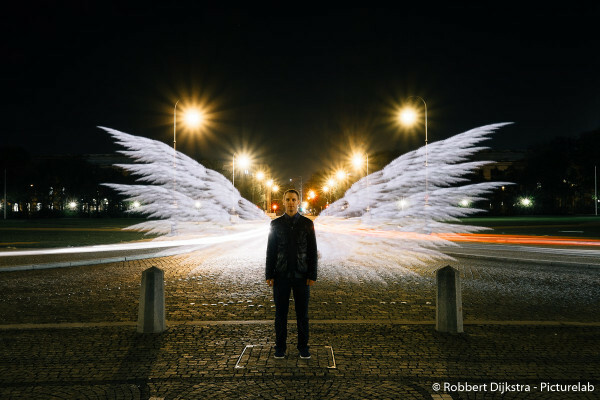 This means that you can use any image and ‘print’ it in mid-air during your long exposures. What is unique about the Pixelstick is that it is one of the first “high-tech” tools for lightpainting photography. It enables people like me, who have little to no experience with lightpainting to make amazing pictures because the Pixelstick takes care of a large part of the work, leaving you with the possibility to focus yourself with the creative part. All this sounds very exciting, but the big question is always how well will it work in practice. Fortunately Bitbanger Labs, the creators of the Pixelstick honoured our request to send us a sample so we could write this review. I have to say I was quite excited when I received the Pixelstick. It had been quite some time since I had been following the Kickstarter project and therefore my expectations of the unit were rather high. Not only because it seemed like a great tool, but mainly because of the fact that I was expecting it to be way for me to discover lightpainting. It happened more than once to me that high expectations led to disappointment when unboxing new gear. With the Pixelstick this was absolutely not the case. 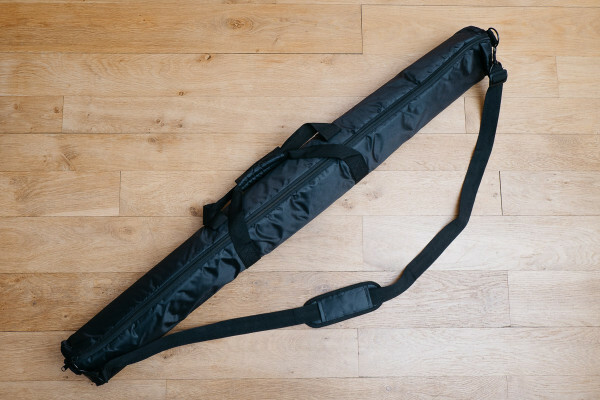 The Pixelstick came in a protective padded bag which can be used for transport and storage. This bag has been specifically designed for the Pixelstick with great care. All other parts, similarly to the bag, have been designed with the utmost care. It really feels like a high-tech product. All parts and components have been custom created for the Pixelstick and you can absolutely notice this when you hold it in your hands. 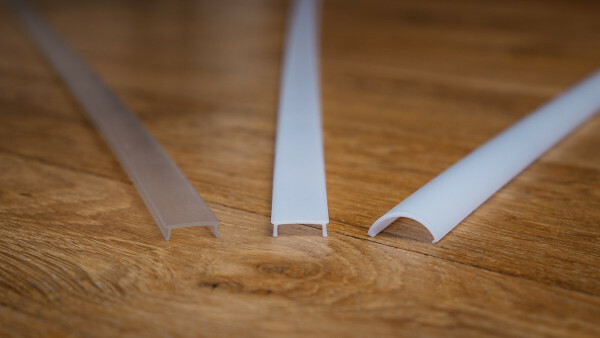 As an example: the aluminium profile; this has been created specifically as the base for the Pixelstick and it feels like it could be a part from a jet fighter. It feels extremely solid and well designed. Due to the size of the Pixelstick (almost 2 metres long when ready for operation) some assembly is required. Essentially, the Pixelstick breaks down into two parts of one metre each for transport. The first time you will have to mount some other components to the aluminium profile as well, but this can be left attached afterwards. 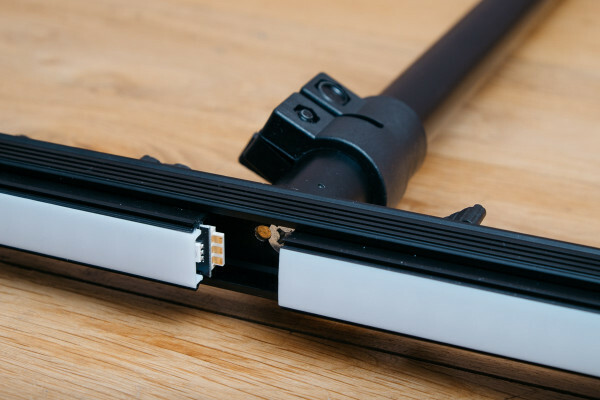 Things such as a hot shoe mount (for a trigger), the controller and the battery can be freely attached along the length of the Pixelstick. To do so a modular system is used, which means when Bitbanger Labs (or you) would create some extra accessories it is possible to attach them as well. I am happy with the fact that the Pixelstick can be split into two parts because carrying a single two-metre-long ‘stick’ would have been rather impractical. However, if connecting joints are not well-engineered they become the weakest link in the structure rather quickly. To maintain proper build quality it is essential that they are well designed. Fortunately this is the case; when the two parts are connected they form a sturdy single piece. During the first sections of this review you can already have noticed that I am very pleased with the build quality of the Pixelstick. The materials used, the design and the construction are all very good. Kickstarter backers of the project had to wait almost a year for the Pixelstick but it is clear what Bitbanger Labs had been doing during this time. Not only the build quality seems to be really good, the design itself is sleek and impressive. For now I cannot think of something bad to say about the build quality. The first Pixelsticks that were shipped to backers of the Kickstarter project had some first-generation issues. Two of the most common issues were that the glue in the handle was insecure (error in manufacturing process) and the battery cable did not prevent reverse-polarity properly (mis-design). Bitbanger Labs quickly addressed the problems by sending replacement parts and from other people I have heard that the customer service is stellar. Issues are quickly resolved. An important component is the controller that determines the pattern the RGB LEDs will display. As I mentioned in the introduction, it is possible to load your own images on the Pixelstick and use these for your pictures. In order to do so you will need to prepare the pictures and save them on a SD card. They need to be resized so that the height of the image is 200 pixels high and save it as a 24-bit BMP image. Tutorialson how to do so can be found online. Besides preparing images yourself you can also download the images Bitbanger Labs made available on their website. It seems that the user community is also sharing quite a lot of their self-made images, but this is currently done through Facebook or Flickr. I would like to see a website dedicated to sharing these files; perhaps Bitbanger Labs is able to make something like this. 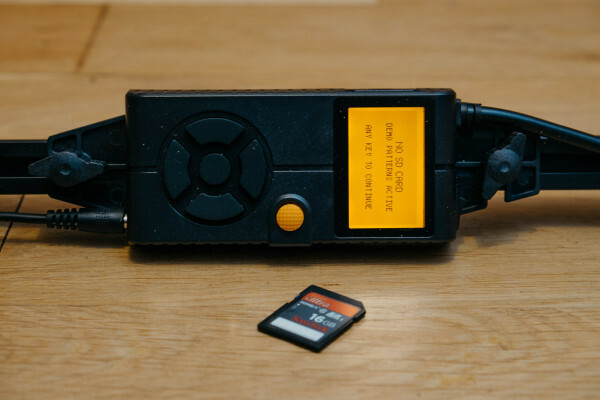 Once the SD card with the images is inserted in the device it is possible to select your image. Due to hardware limitations the Pixelstick is only able to access files in either the root of the SD card or one folder down. Filenames are limited to 5 characters, so if your file is called IMAGETWO.bmp it will show as IMAGE~.bmp. A bit annoying, but it is something that can be dealt with. You will have a bigger issue when you forgot the name of your file. This is when you are out of luck. Unfortunately the controller has monochrome LCD display and is not able to give you a give you a preview of your images. It does however feature an excellent display making it easy to read in the dark. If you managed to select the correct file you are able to start shooting directly. However it is also possible to change various parameters, such as the speed, brightness, white balance and more. Changing these will affect the way how your input image turns out on your photo. Most of these options are self-explanatory, however there is a manual included in the bag, but I have not needed to use it often. The menu structure on the controller is well thought out and easy to navigate using the D-pad and buttons on the controller housing. Due to the limited number of options it is simple to navigate through all the different options without being overwhelmed. 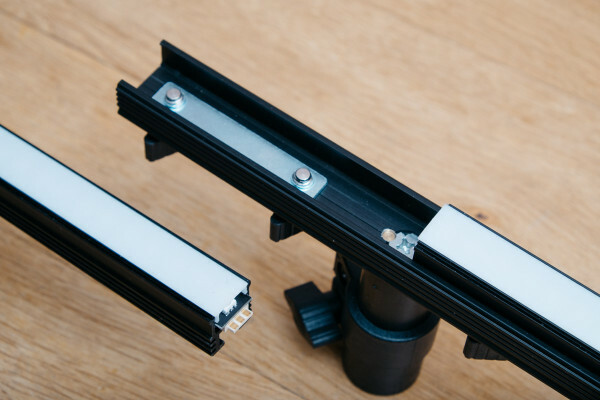 It is possible to mount different plastic covers over the RGB LEDs, which are referred to as lenses. These lenses are basically diffusers for the LEDs and determine how the light of the LEDs would appear on the photos. 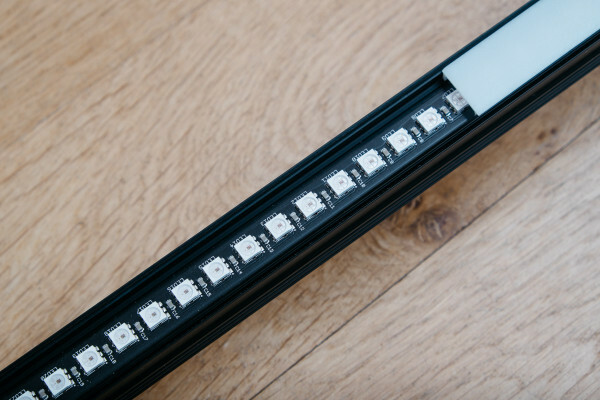 Since the individual LEDs have some space between them a diffuser is required if you want the whole strip to appear as a solid bar in pictures. Undiffused light will make the LEDs more appear as stripes, i.e. you will see so-called scanlines. Diffused light makes the transition between different LEDs less visible, but you will lose on sharpness. For example, when pixel 1 displays red and pixel 2 displays blue it would appear on a undiffused photo as red and blue, with some space between them. On a diffused photo they will appear as red, purple and blue with no space in between. In the middle the light of the blue and red pixel simply mixes and forms purple light. 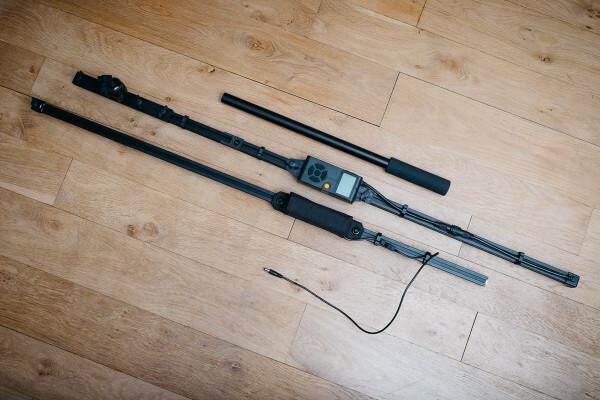 There are three lenses available for the Pixelstick with varying ranges of diffusion. The one included with the Pixelstick provides a good balance between diffusion and sharpness. Two optional lenses can be bought which either diffuse the light more or less. Personally I dislike the appearance of the scan-lines on my photos since it feels too digital, but I do not want to comprise on sharpness. Therefore the standard lens is my favourite, since it makes a good compromise on sharpness and diffusion. Similarly to flash photography, it can take a few passes to dial in the settings which give the desired look to your image. Personally for me this never took me more than a few minutes to complete. Mixing ambient light with the light from the Pixelstick can be quite tricky to do, since both light sources have to be balanced. Again, this is also the case when one is trying to mix flash with ambient light. There are a few remarks about the process. 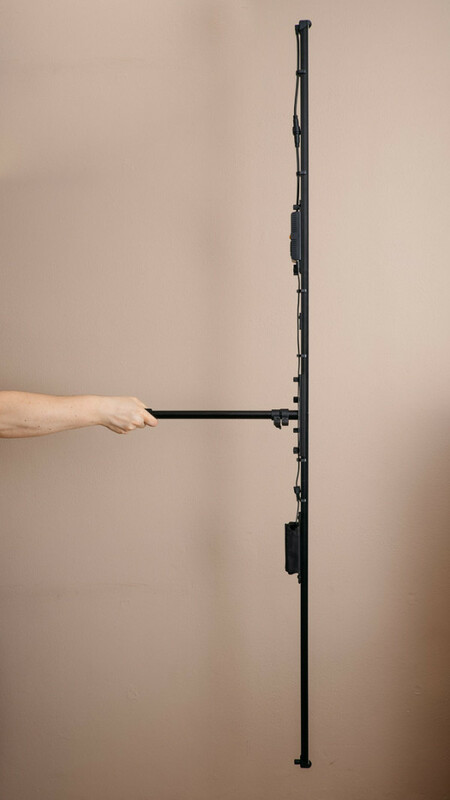 The Pixelstick is held in the middle using a handle. It is essential that when you move this handle you do so in a linear motion without too much movement in other directions, otherwise the lines that the Pixelstick print in the air become wavy. 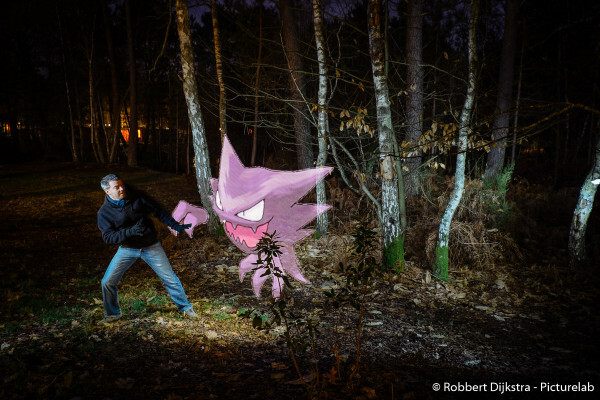 The pace with which you are walking also affects the way how the image appears on the photo. For optimal results you should move with a constant pace in a linear motion. To start the Pixelstick you can press a button next to the D-pad on the controller or trigger it using a 2.5mm jack, a similar method to triggering some cameras. 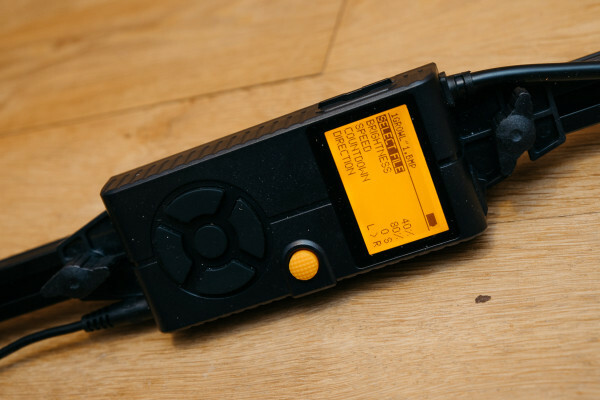 This means it is possible that you are able to use two receivers, one for the camera and one for the Pixelstick with a single trigger. Epically when you are shooting alone this can be very convenient. This shows that Bitbanger Labs did indeed think of the ergonomics while designing the device. Something that is not included with the Pixelstick is creativity. The Pixelstick can be seen as a lightbrush. It still requires creativity in order to gain good results with it. Similarly to a painter and his brushes, the creativity comes from the artist and not from his tools. 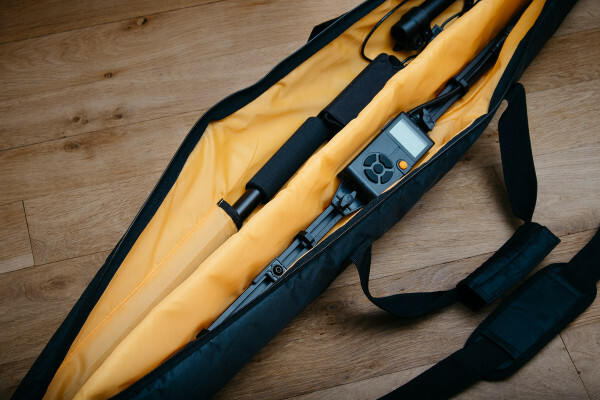 The same can be said for each piece of camera gear, but somehow I have the feeling it is different in this case. Other camera gear is more technical and it is easier to explain for me. Maybe it is because normal camera is being used by everyone already and this gives a good impression what is possible with it. 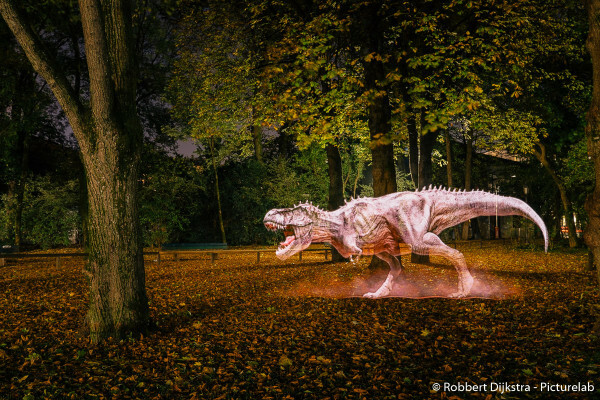 Using the Pixelstick you enter the unknown, what also happens if you start lightpainting. There are so many possibilities that you need to have a very good idea of what you want to make, otherwise you do not know where to start. In a way you are pushing the boundaries of photography, since this technology makes people able to shoot pictures that have not been possible yet. My first impressions did not change over the course of this review. Without doubt I can confirm that the Pixelstick is an extremely well made tool. The hardware and execution are superb; Bitbanger Labs has done an amazing job. The Pixelstick is very easy to start with, exciting to use and the results you can get with it are certainly unique. By “unique”, I mean that the Pixelstick enables photographers to shoot very different photos to without it; it opens a new world, so to speak. Not all is completely perfect though with the hardware itself. There are two improvements that I can think of if Bitbanger Labs would ever want to launch a second and improved version. A big annoyance for me was the impossibility to preview the images which I would select. The next version should have a colour LCD for sure. My second suggestion would be to put a little diffusion dome on each pixel, removing the need for the so-called lens. This way pixels of the Pixelstick would have no space between them and still appear crisp and sharp. Unfortunately there is one bigger remark besides the improvements I suggested, which is the price. The price for which it is currently being sold is $349, which is quite a steep price for what is a one-trick pony for many people. You need to be creative to unleash all the potential of it. If you cannot manage to do this the result quickly becomes repetitive and dull. As written in the introduction, I expected from the Pixelstick that it would introduce me to the world of lightpainting. I can conclude it certainly managed to do this and more. 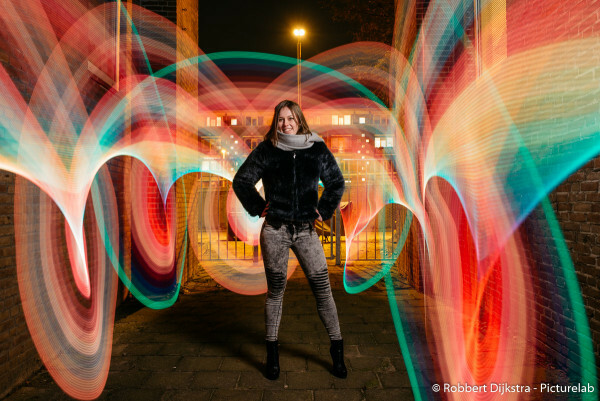 The Pixelstick can introduce someone to a new type of lightpainting, a highly exciting one in which the possibilities are endless. I absolutely love it, both using it and the hardware itself. The combination of the design and materials used make it feel like you are using a piece of art. In the end the question always is if the product is worth the investment. For professional photographers that are interested in this type of photography then absolutely yes. It will enable you to make something unique and it can be a method to distinguish yourself amongst the crowd. For amateurs it is a more difficult question. The question you should ask yourself if you could unleash the potential it has to offer. While the Pixelstick is easy to use, like lightpainting, it is hard to master. If you are still doubting, I would recommend you to buy it. It is truly a lot of fun to use. It cannot be compared with anything else currently on the market.